I had the chance to talk to Olcay today, one of the activists who broadcast live from Taksim square in Istanbul with Radyo Gezi. She’s a member of Müştereklerimiz, an ecological organisation. 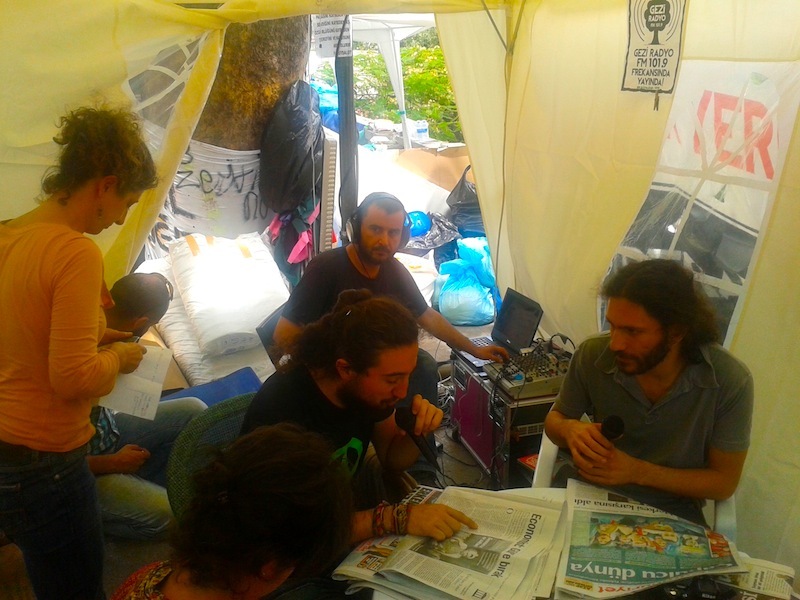 Radyo Gezi is broadcasting from a tent in the park and can be received as FM radio around Taksim square. You can listen to the stream from all around the world – there’s news in English at 12:30 and 19:30 now every day, and in between interviews with the activists and groups who protesting for two weeks now. What about? Everything started as a sparkle, in the park. A couple of trees really. But that was just a sparkle and now everything has turned into asking for our right to live in the city with giving decisions for our life. So this is libertarian, asking for liberty, asking for democracy, real democracy. Everybody is shouting now for the real democracy. Not the fake one as they are practising now. This is totally different. I am 42 years old and I never seen any revolt like this in my life. In the interview you’ll hear about who’s protesting, what makes this movement different from many other protests in Turkey before and how it relates to other protest movements around the world. We are doing everything without any authorities, without any leaders. Everybody is sharing the work. We don’t want them to decide how we live and how we decide for our life. They come here with their oriental way of looking, views, and then try to analyze things with their very European mind. But they learn. We all learn. Es sieht so aus, als ob der Ausgang des Prozesses entscheidend von den selbstgedrehten Filmaufnahmen abhängt. Verschiedene Prozessbeobachter, darunter mehrere Professoren, äußern deutliche Zweifel an der Rechtstaatlichkeit. Hier nochmal die Chronik zum Verfahren.